Epocrates delivers the most current safety, diagnostic and treatment information, right when you need it. On average, providers report saving 20 minutes or more a day with Epocrates. Because you can access Epocrates intelligence instantly, your attention stays where it belongs: with the patient. Check for potentially harmful interactions between up to 30 drugs at a time. Review evidence-based, patient-specific guidelines condensed for the moments of care. Consult in-depth, peer-reviewed disease content developed in collaboration with BMJ. Send secure text messages to colleagues or create group chats with care teams. Look up concise monographs for popular herbals and other supplements. 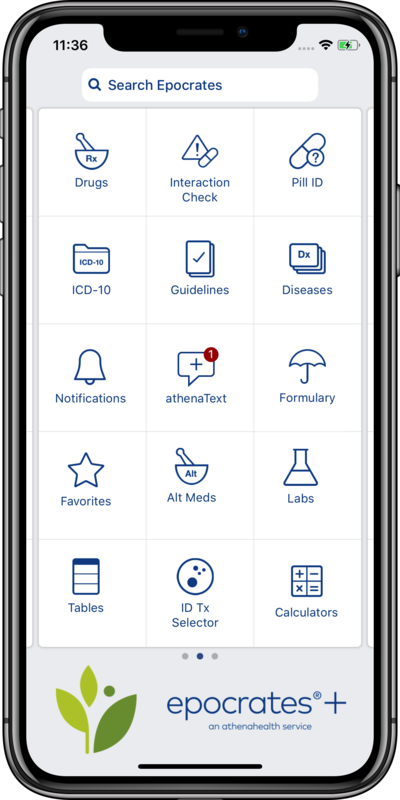 Epocrates Plus delivers even more clinical intelligence, including clinical practice guidelines, in-depth disease content and alternative medicines. All for just $174.99/yr. The Epocrates information you trust is embedded in the EHR ranked #1 for usability by KLAS, so you can make informed decisions more efficiently than ever. Explore athenahealth's cloud-based services for EHR, medical billing and patient engagement. Discover why clinicians are more likely to prescribe antibiotics later in the day and strategies to prevent it from happening. Get strategies and tips from top performers to improve your practice’s clinical performance.